I came across a pile of old report cards from my elementary school days, this one dated June 11, 1956. I laughed out loud. She enjoys doing a lot of independent reading! And phew, I was promoted to third grade. Yay me. I was one of those students who did really well in the subjects my brain could manage – like languages and writing, even American History. Other subjects, not so much. I think I peaked in 6th grade, after which I moved over to a top notch private school, a very heavy learning curve for me. I won’t show you my high school report cards where I was always in the last quarter of a very smart class. Even though I was in AP French, AP Latin, and AP English, I’d get D’s in every math and science class I took, and I think the teachers were being kind only giving me a D. I adored History, adored my History teacher, who was fired very quietly in the dark of night, never to reappear. Rumor was he was gay (or queer as we could have said in 1966) and made advances to one of the guy students. I remember being crushed that he was gone. He brought History alive and I learned a ton. So while I might get in the 90s in French and Latin, I got 80s in English and barely in the 70s for algebra or geometry or science. Hence, being in the bottom tier of my classmates. It was a bit demoralizing to always be in the 4th Quarter of the class rankings and my two closest girl friends were complete geniuses – one went off to Stanford, the other to Mount Holyoke. You already know by reading this blog for years, I did NOT go to Stanford, I did NOT go to Mount Holyoke. I’ve often thought over the years that perhaps for me, private school was not the right choice for high school. I might have done better being the smartest one in a public high school than the dumbest one in a private school. I know my parents felt this was an fabulous opportunity but I struggled too much to ever feel smart, even though I knew I was capable in several aspects. Great story. I don’t have any of my old report cards. I guess my mom didn’t save them. You’re lucky to have them to look back. Very nice piece. I think was is equally impressive as your accomplishments is the fact that the teacher took the time to TYPE out the thoughtful evaluation. Today it’s like a multiple choice response home. Times have changed!! In those days teachers were the top of the heap – it was considered quite a feather in one’s cap to teach and I remember adoring all my elementary school teachers. My parents had such respect for them too. I’ve said this here before but the women’s movement told college grads they could do better than teaching – they should all be doctors lawyers and only CEOs. Teachers are the backbone of tomorrow. Good teachers that is. I was very lucky – I had incredible teachers. You are one of the smartest people I know. The breadth and depth of your knowledge is uncanny and your writing style is addicting. Not everyone who is excels at getting good grades does well in life. I’m happy you are a blogger. I’m hardly the smartest one in the room but I am curious and l love knowing lots about a lot of things. Writing comes easily to me. My “style” is simply me having a conversation with you all as if you were at my breakfast table. I think people can relate to that. It’s not pure writing, it’s extemporaneous thinking out loud! So much has changed in elementary schools since your day. You were taught cursive writing, you were put in reading groups by your skill (a good thing), you had recess, probably more than once a day where you could play dodgeball, you had teachers who loved what they do and who were respected, and teachers took the time to write individual report cards. I did well through high school and wanted to go to MIT but my parents were appalled that I wanted to be a scientist. They, and my high school guidance counselor, guided me against applying there. I did get a good college education but I wonder what would have become of my career had I gone to MIT as I wanted. Your blog is always an easy read. Your style is very fluid and enticing. What happened to your Clay Travis post? I had a perfect link to add. Bloggers prerogative to delete. It was one of those posts that seemed funny last night but by morning, not so much, and just not my style. Ok but it was a good story and Clay is making the most of his comment by doubling down today mocking Baldwin. It’s not that it wasn’t a good story. It was more I didn’t feel I could do it justice. I think the story was both funny and serious. Travis deliberately presented them with the conundrum of the consequences of free speech and they failed. You asked whether any one has a sense of humor and the answer is that it takes a modicum of intelligence to process humor that no one on that despicable network possesses (Anderson Cooper excepted). CNN has a history of simply cutting off discussion that they dislike versus talking it out and letting the audience make there own determination. I would have kept the post up except I didn’t like the WAY I presented it. I wanted the story to be there but sometimes it takes a lot of thought (on my part) to put together a post. I rushed, didn’t like what I did, and decided to take it down. It’s not that I thought the story was unworthy. It was my delivery. Any channel that has Chris Cuomo on it is not for me. I don’t even like Anderson Cooper anymore. They’ve all got the air of TrumpHate on their breath, so why listen? I’ll never get out of my head the photo of the CNN crew on election night. They were sick to their stomachs. How, with that much agenda, does anyone expect journalism? They don’t. NOW, as for that Katie Hopkins tweet. My favorite response is “I guess it’s show and tell”! Whoa. She totally misunderstands________________________________. Fill in the blank. Every day, a new Hillary interview, a new story of her loss and why. If she’s this perplexed at why she lost the presidency, how could anyone expect her to handle real world problems? Dodged a freaking bullet. That car is everything. Growing up in duPont-GM land, there were some serious Cadillac collectors. 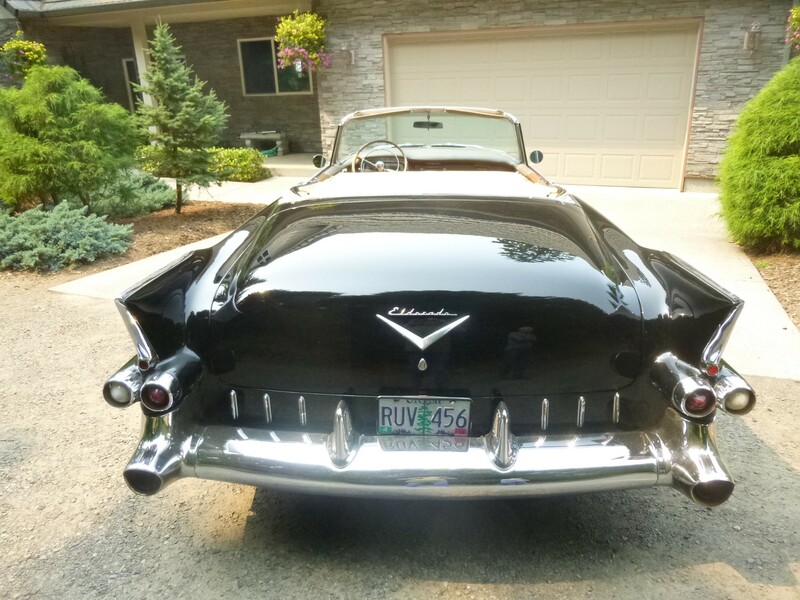 One friend’s dad only bought dark green El Dorado convertibles (in the day when you could buy a car in more than silver, black, and white). Another only had black El Dorado’s. But this one, this is everything beautiful about a car. Thanks for posting. I have known many who regretted being sent to, or sending their kids to, private school. But rather than tough academics, around here it’s been more that if you’re not a .00001%er, and also thin, athletic, and good-looking, well — it won’t be much fun. I actually have a coworker who lives in New Canaan and sends his kids to private school because he considers it a less competitive, more holistic — not just grades-based — environment. And when I talk to people who send their kids to private school, it’s about 50/50 between “my kids aren’t being challenged enough in public school” and “my kids need extra help/attention,” so these days it’s hardly just for high achievers. And I think if you gave most private school parents truth serum, at least 50% of the decision would come down to status and networking. For my parents, sending my sister and me to private school was giving us opportunities they didn’t have. We decided to give our children a private school education with mixed results as not all kids learn the same way or are a fit for private school. They went off to boarding school in 9th grade which was an excellent decision. Different boarding schools for the different ways they learned and their different athletic skills etc. One private school in a small town like Bedford (or New Canaan, or wherever) is tough on the kids who, as you said, don’t fall into the mold. It wasn’t until boarding school they blossomed, finding their own niche, their own talents, away to have to learn to manage learning how not to get in trouble…. Half of my private school class went off to boarding school after 8th grade. It was traditional for the boys to attend the schools their parents and grandparents did. Many of the girls went to schools where they could ride horses. Networking is not a bad thing and private schools and also prestigious colleges, allow for seriously important networking when it comes to jobs. We have a good friend whose son went to Bates College in Maine and when he was applying for jobs, the man hiring went to Bates and gave him the job pretty much sight unseen. That’s a good thing. Every parent makes the decision that is right for them, their finances, their children. I come from the “to each his own” school. ← Quiz for Old Fogies Only!